With summer fading into fall, our thoughts are turning to the holiday season and what the new year will bring. Plans have indeed taken shape for the 36th All Cal Meet and we’re eager to share the latest information. Host hotel: Feather Falls Casino & Lodge, Oroville, CA, is taking reservations now. There are 49 Deluxe non-smoking rooms (40 w/King, 9 w/2 Queens) and additional smoking rooms available for us. Also, 3 non-smoking Studio or Suite rooms are available for VCCA. Reservation deadline: 30 days prior to event. Separate parking area for VCCA hotel guests. Trailer parking available onsite. Breakfast Buffet is included on Friday. Feather Falls KOA RV Park – We have 30 spaces reserved at group rates of $40/$42 per night. We are coordinating reservations for all those staying in the RV Park and will need the information for your rig. Your registration form includes the information for your campground reservation. Campers will pay the KOA office upon your arrival. A pancake breakfast is included on Friday. Please note that we have not made special arrangements with these hotels. Registration: Family (2 persons) $130; Single or additional persons $70. Includes: Welcome party, all tour destination entry fees, awards banquet, and more. Registration deadline March 31st. T-Shirts: Ladies’ & Men’s in all sizes, $12 each, can be purchased when registering. Raffle Ticket Special Price: 40 tickets for $20 when registering! Thursday arrival and check- in, late afternoon welcome party. Friday is a full day of touring, beginning with a cruise of the Sierra Nevada foothills. Lunch on your own, then continuing north to the Abbey of New Clairvaux & Winery. Optional evening activity: Enjoy the festivities at the monthly First Friday Celebration in historic downtown Oroville (one of the Northern California gold rush era towns, with restaurants and antique stores in abundance). Saturday morning tour to the Bolt Antique Tool Museum and Oroville Chinese Temple. Afternoon car show (just-for-fun awards) and beer garden, followed by our evening awards banquet, trophy presentations and raffle drawings. 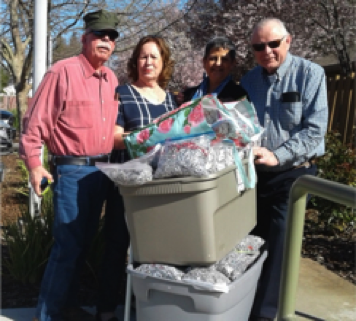 Sierra View members delivering 336 lbs. of aluminum pull tabs! Get your family, neighbors and co-workers involved – it’s easy to save those little pull tabs in zip sealed plastic bags. We’ll weigh the aluminum loot from each region and announce the winner at the awards banquet. Check www.rmhcnc.org for a look at some of the wonderful services provided by Ronald McDonald House. Collecting the aluminum tabs is an easy way to support the great work this charity does for families in all our communities!